I’m an active volunteer at our church, wife to my prince charming, Ben and homeschooling mom. I’m pretty busy with an eight year old Jedi, Chris and six year old Kylee, my budding ninja/princess. I love indulging in predawn runs, soy hot chocolates, and pedicures. I read everything. I bake a legendary “burnt” chocolate chip cookie, pin vegan recipes and complicated crafts which I have no intention of making and help plan vacations for future Mouseketeers. All this time passing on the pixie dust blossomed into my newly rebranded blog, Adventurer Mom and @Adventurer_Mom on twitter. My favorite days (be they at home or in the Fantasy) involve waking up just before dawn. I lace up my running shoes, pick out a playlist and sneak out of my bedroom without waking the children. I walk to the nearby track, humming to myself. I walk a lap. Then just as the sun is beginning to peek over the horizon I begin to run. The Disney Cruise Line is our home away from home, our ticket to paradise and our favorite place to stay in the magic. I run into the sea breeze on deck four for a while then head back upstairs to our stateroom. I shower while prince charming heads out for his run. When he comes back to the room, the princess/ninja wakes up and insists on breakfast. The Jedi sleeps on. 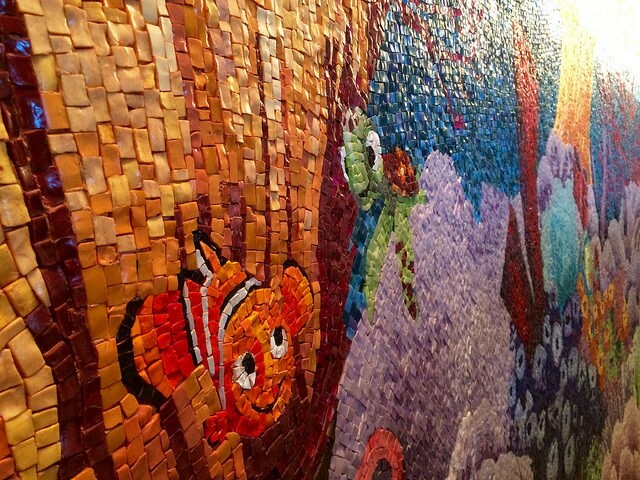 We always swing by to say hi to the Nemo and Squirt mural when we’re in Cabanas! Kylee and I hit the buffet and she eagerly awaits her very own vegan waffles while I enjoy some of the fruit. After the princess and I finish eating, we head back to discover the Chris awake dressed and hanging out on the verandah with Ben. 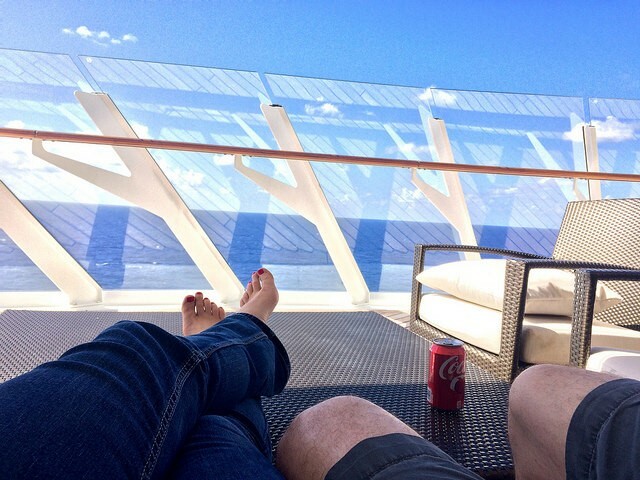 Ben and I look over the Disney Cruise Line Navigator app and discuss a few different possibilities. Today they’re offering family animation classes, bingo, trivia, mixology classes, mini-golf tournament (if we passed for 18-21), the Captain’s welcome reception and the NFL games for the day. We checked, but the room service the guys ordered for breakfast did the trick, so everyone eagerly changed into their swimsuits. After both kids splash in the pool for thirty minutes, it’s time to get serious. Neither of the kids is old enough to ride alone, so we have an excellent excuse to ride the water coaster out over the edge of the ship, around the funnels and down to the pool deck. After a trip or two, the kids remember that the Oceaneer Club and Lab opened up. After showers and in clean clothes, both kids cheerfully wash their hands and dash into the club without as much as a backward glance. Ben and I head back to our suite to relax for a bit. Then it’s our turn to change. 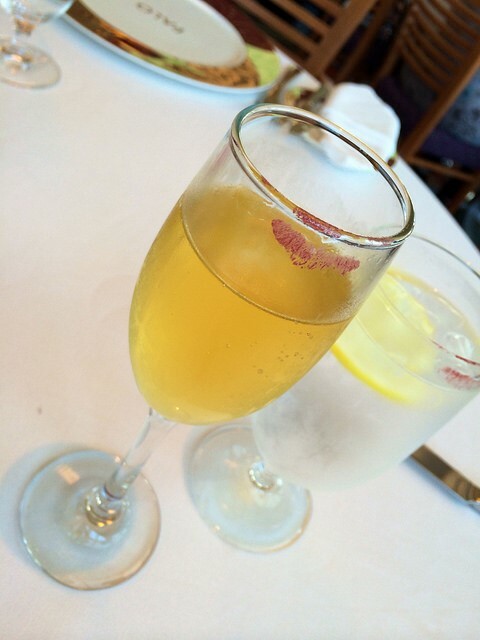 It’s a little strange to get all dressed up for lunch, but Palo is worth it! We like to eat brunch on the first sea day of the cruise, as it helps us slow down, unwind and get some couple time in right off the bat. 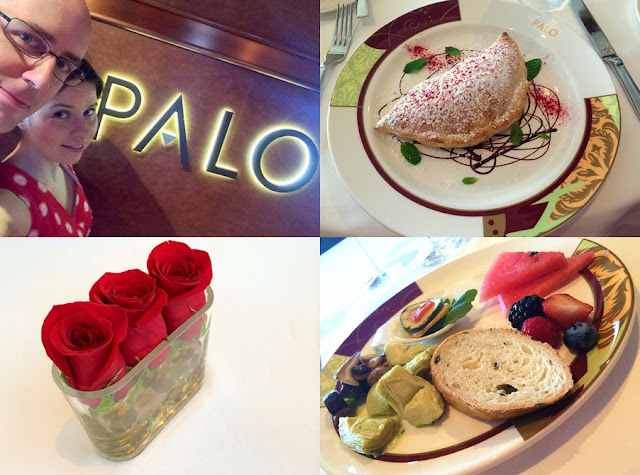 Palo is $30 per person for either breakfast or lunch, adults only and completely fabulous in an unstuffy way. Besides, all you need is slacks and a button down so it’s not that dressy! Ben orders his favorite, the grape gorgonzola pizza, while I opt for something slightly more vegan. In Palo I’ve had remarkably good luck asking the chef for whatever he's like to make. After brunch, we stop by the club to check on the kids. They ate their lunch with the rest of their new buddies and busy talking to Crush and jumping all over the magic floor. Yes even the floor in the clubs is magical. After such a fantastic brunch, some lounging about was next on the docket, so off to the lounge we headed. A little while later we wandered back to the atrium to see if any good spots for the Character Dance Party were left. I’d say it turned out magically! We were close enough we could almost touch the characters as they ran up and down the atrium stairs. I love Disney songs and I love trivia, so naturally we headed down to team up in The Tube and see if we could out Disney Tunes Trivia our fellow shipmates. 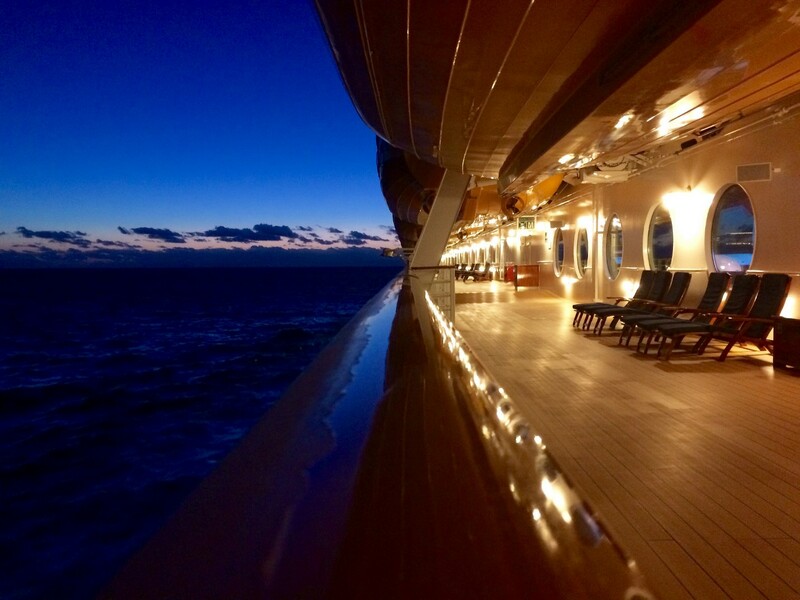 After several more adventures and time to explore (after all, it is only our first sea day of this voyage) we retrieved the children to get ready for formal night. All dressed and nowhere to go? Not really. The dress on a cruise ranges from evening to evening. Whether you’re more formal or cruise casual or even pirate, you’re good to go. Dinner seatings start precisely on time, so arriving downstairs early gave us time for a few pictures, time to chill and time to start up a game of Midship Detective Agency at the agent recruitment facility. We didn’t need to select particular restaurants, as they assign a rotation for you to follow during your vacation. We do make a point of booking main dining (5:45) rather than (8:15) late dining. 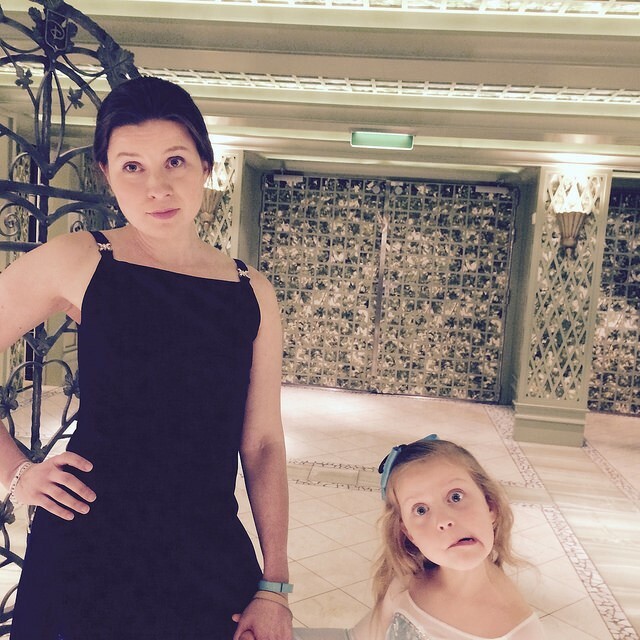 Our early to bed and early to rise kids stay up easily for the theatre, but delaying dinner is a whole other thing! We make Goofy look good. We’re listening to Ben tell us not to freak out but that the gate behind us is swinging with the ship rolling. Hence Kylee’s “we’re all going to die” face. As you can tell, going to Enchanted Garden is pretty serious stuff. The kids explained that they needed to go back to the Oceaneer Lab the next day as they were essential to the detective group trying to solve the mystery of Captain Hook’s lost hook. Is the club really that interactive? You’d be surprised. After a super yummy dinner of Naan, rice and mild but yummy vegetable curry, for Kylee and I and Sea Scallops for the guys, we were all excited to go see Aladdin. After changing Kylee into something less sparkly and scratchy, of course. We chatted up the platinum guest queueing outside the theatre. One of the unsung perks of cruising Disney is the amount of time you get to chat with cast members, guests and family alike. Ben and I took turns holding our place in queue and taking the kids window shopping. Queueing paid off with front row seats to Aladdin, a spectacular the likes of which you are unlikely to see outside of Broadway. It’s a beautiful production. Engaging, honest, energetic and sweet. With just the right amount of happily ever after to make Aladdin a perfect good night story for our much worn out kiddos. Thankfully it’s a short walk upstairs to our stateroom where the kiddos pass out in their beds. Ben and I grab water out of the fridge and head out on the verandah to watch the stars reflect in the sea and dream up some wonderful, magical plans for the next sea day. I don't know about you but I am ready to set sail!! Thanks so much Lori! 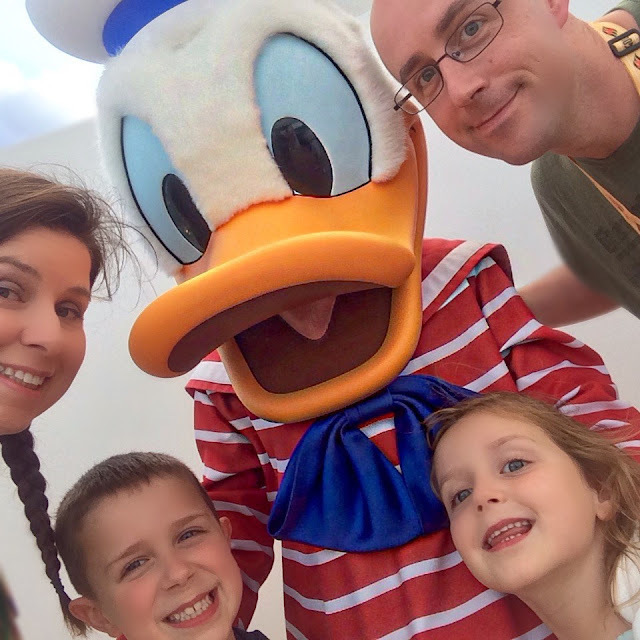 If you would like to learn more about Disney Cruise Line I definitely recommend you visit Adventurer Mom! Follow her on Facebook and Twitter! 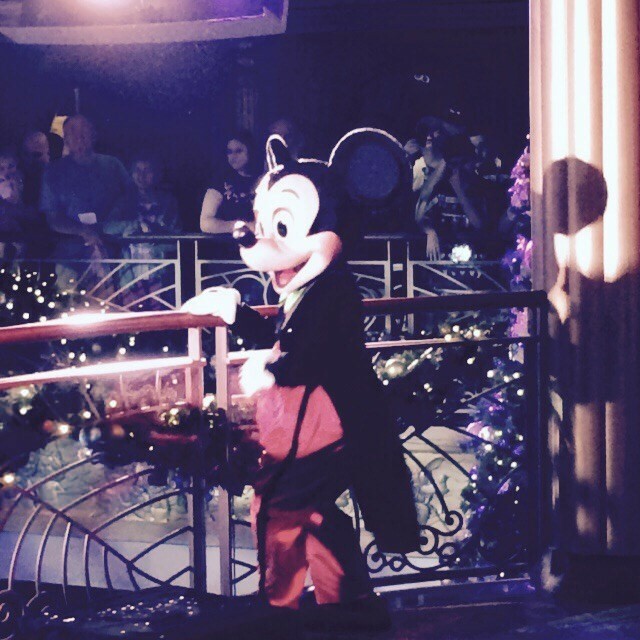 When you are ready to start planning your own Disney Cruise Line vacation I would love to help! You can request a quote today via email (donnakay@thewdwguru.com), calling 877-825-1646 ext 706 or clicking my button on the right. 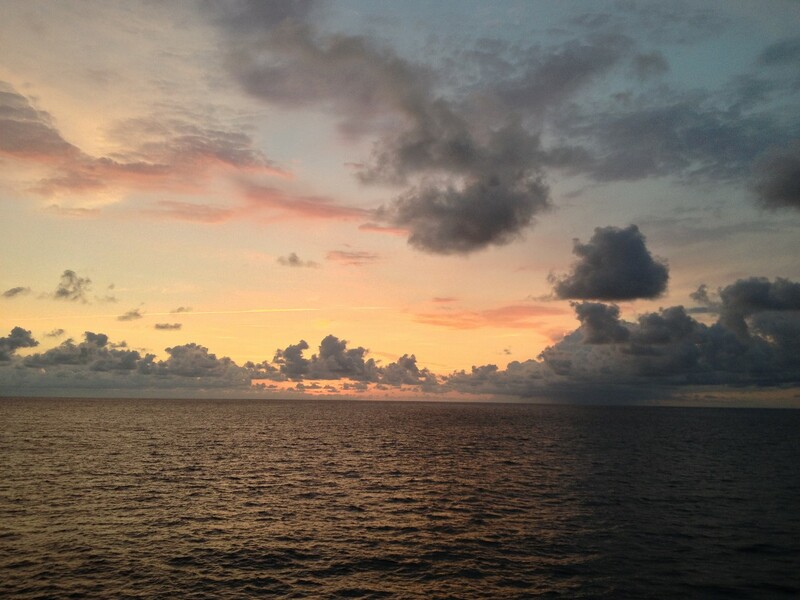 Sounds like a great day at sea, great food and ending the day with the show is always a highlight of our days at sea. Thanks for sharing, I'm looking forward to this series! Thanks Sean!! So am I - I love hearing how my friends spend a Day at Disney!! I really want to go on a Disney Cruise TODAY!! Thank you for inviting me to guest post! Lori the honor was definitely all mine!! I love the post and am thrilled to have you as my guest and friend! !